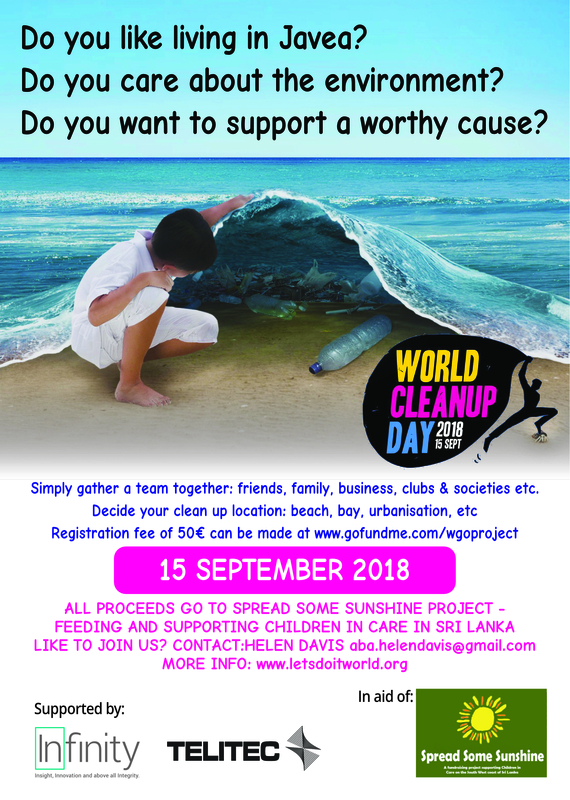 September 15th is World Cleanup Day! The charity ‘Spread Some Sunshine’ is organising a co-ordinated cleanup in the local area to raise awareness of environmental problems and to raise some money for the orphanages they support. World Cleanup Day has an amazing back story. It started in 2008 when an estimated 4% of people living in Estonia came together and cleaned up the country in just a few hours for free, improving their living conditions as well as saving the government millions of euros. Now similar efforts are organised worldwide every year. Plastic in particular is a problem in many coastal areas like Javea, and if a few volunteers can clean a whole country, we can certainly clean up the town! Telitec and Inifinity International are proud to be sponsoring this great effort,and we hope you´ll consider making a team. All you have to do is put together a team of friends, co-workers or family together, pick your cleanup location, and donate your registration fee of 50€. Contact Helen Davis by emailing aba.helendavis@gmail.com for more info and to talk about joining in the big cleanup!